Highland Perthshire was the focus of traditional Tay Salmon Fishing Season opening celebrations on Friday. Minister for Environment, Climate Change and Land Reform Dr Aileen McLeod did the honours in Dunkeld, while Provost Liz Grant was among the VIP guests at Kenmore. The Dunkeld ceremony, which took place on the Tay at the Hilton Dunkeld House, was organised by the hotel in conjunction with Dunkeld and Birnam Angling Association, the Dunkeld and Birnam Tourist Association and the Perthshire Chamber of Commerce and supported by the Tay District Salmon Fisheries Board (TDSFB) and the Tay Foundation. 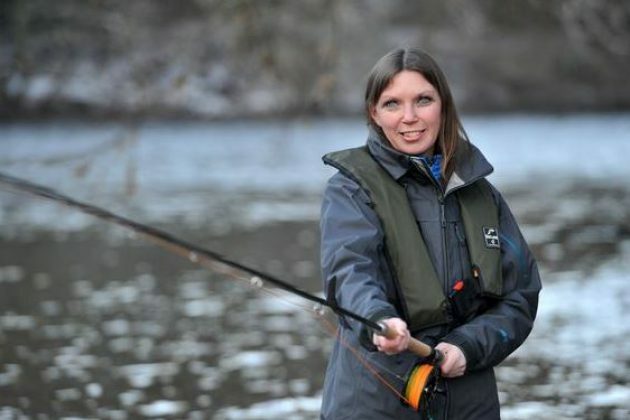 Dr McLeod said: “It is great to be here to make the first cast of the salmon fishing season on the Tay. “Scotland is recognised across the world as the destination for salmon and freshwater fishing. “Game and coarse angling is worth more than £100 million to the Scottish economy, and supports almost 3,000 jobs, which shows the importance of maintaining and enhancing the quality of our rivers and fish stocks. William Jack, chairman of the TDSFB, added: “I am delighted that the Minister has accepted the invitation to open the Tay salmon season. Dr David Summers, Director of the TDSFB, continued: “There is particular interest in the Tay this year as our ‘spring’ catches have been tending to increase in recent years following a period of decline. At the Dunkeld ceremony Dr McLeod presented the FishPal Malloch Trophy – for one of the largest salmon caught by an angler on a fly and safely returned during the year in Scottish waters – to the 2015 winner. The successful angler was Tom Buchanan from Barrhead in Glasgow for a 35 lb salmon caught on the River Lyon (a major Tay tributary) in Perthshire. The Kenmore event was attended by Provost of Perth and Kinross Liz Grant, three times World Speycasting Champion Scott Mackenzie and Mark Stephen, presenter of BBC Radio Scotland’s ‘Out of Doors’. The official opening, which took place outside the Kenmore Hotel, began with anglers and well-wishers from all over Scotland gathering in Kenmore Village Square. Provost Grant then led them and the Vale of Atholl Junior Pipe Band down to the banks of the River Tay to carry out the ‘blessing of the boat’. Scott Mackenzie then made the first cast of the day to herald the official opening.